Injuries that result from slip-and-fall accidents can be severe. 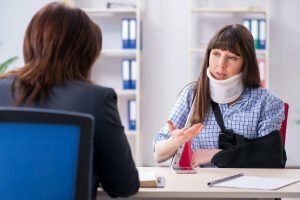 You may be seriously injured and unable to continue work. Moreover, this can happen to you or a loved one nearly anywhere. When your slip and fall occurs because of someone else’s negligence or careless action, they are legally responsible to compensate you. Philpot Law Firm PA is here to help you manage this process. There are many factors and scenarios that can cause a slip-and-fall injury. These include icy or wet sidewalks, cracked pavement, uneven floors, unmarked steps, safety code violations and other unsafe conditions. No matter what has caused your accident, our team is ready to help you make your recovery as simple and hassle-free as possible. You can trust us to aggressively defend your rights. When you are injured as a result of another’s actions, you can receive compensation. Our team will partner with you to determine the facts, establish who is at fault. You can trust the legal team at Philpot Law Firm PA to pursue your best interests. Protecting your rights is worth putting us to work for you. We specialize in working with insurance companies to get you what you deserve. Insurance companies have an interest to minimize their payout to you, no matter what injuries you have received. They will work tirelessly to end a liability case for the lowest expense possible. However, this may not cover your medical bills, lost wages, pain and suffering, disability and other expenses.